The New-England Courant (also spelled New England Courant), one of the first American newspapers, was founded in Boston on August 7, 1721, by James Franklin. The newspaper was suppressed in 1726. James' younger brother, Benjamin Franklin, started in the newspaper as a typesetter, and later wrote more than a dozen articles under the pen name of Silence Dogood. One such article led to James Franklin's monthlong imprisonment after he declined to reveal the identity of its author. Franklin published the paper's first issue against the advice of his friends. At the time, smallpox was breaking out in Boston, and the city's intellectual pursuits had declined. But the newspaper proved a success, and rescued James's struggling printing business. Franklin's younger brother Ben was pressed into service as his apprentice at the age of 12. The apprenticeship included all sorts of odd jobs, including issuing pamphlets, linens and silks. The relationship between James and Benjamin Franklin suffered as the Courant reached the peak of its fame. Finally, in 1723, Benjamin left for Philadelphia. The Courant was the first American newspaper to use literary content and humorous essays. At 4 pence a copy, it was the most expensive newspaper of its time. It consisted of one single sheet printed on both sides, focusing mostly on shipping reports, snippets of information from neighboring towns, and letters from Europe. Its real substance was in letters to the editor from the Boston wits, poking fun at the city's morals and manners. Many viewed the Courant's content as "talking trash," just like other newspapers during this time. But it set the tone for the next 100 years or more of American journalism, marking a break with its poorly written predecessors and contemporaries. The print shop, off Queen Street in Dorset Alley, is today a tourist attraction. 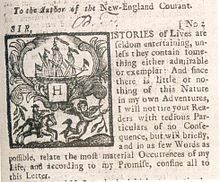 ^ "The Story of the New-England Courant". Brief history and scanned issues, from the Electric Ben Franklin.